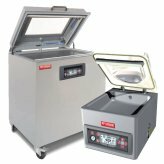 Expand the lifetime of your food with a vacuum packaging machine! Not only does it expand a product’s lifetime, it keeps food fresh and organized. A vacuum machine is a must-have for any commercial food establishment. It provides users with the ability to maintain freshness and to keep food products for longer periods of time. Perfect for meats, vegetables, and cheeses, vacuum packaging machines remove the air from the bag, which allows the products to last longer! Vacuum bag machines are not only good for maintaining freshness; they also provide a wide range of organizational methods. With our large selection of vacuum packaging bag sizes, these machines are perfect for portion control, and for storing items for long periods of time. Interested in a vacuum packaging machine for your home kitchen? We have models perfect for your household kitchen. Save big by buying in bulk, and maintain the goodness by sealing away the freshness!